The first thing you have to decide is whether you want to call in a remedial treatment company of which there are now a great number or to deal with the problem yourself. Before the Second World War, very few firms carrying out this type of work existed, and at that time the average builder dealt with these prob­lems quite efficiently, even without the help of modern insecticides. Nowadays, most building societies refuse to give mortgages unless they have a guarantee from a remedial treatment company that any infestation, however small, has been treated by the operatives of the remedial company. Remove all objects stored in the roof space. If the rafters have been attacked, examine the joists in the ceiling below carefully these will probably have been attacked as well. Remove any roof insulating materials from between the joists and clear any dust from the surface of the timbers with a vacuum cleaner. Industrial cleaners are particularly suit­able for this job and can be hired. If the edges of the rafters (or joists) are severely tunnelled, the disintegrated portions should be cut away with a sharp knife. Cover water cisterns, junction boxes and rubber-insulated cables. The next step is to wet thoroughly the surface of all the exposed timbers with an insecticidal wood preservative. This can be applied with a large brush, but big areas are much quicker to treat by spray­ing. Use a sprayer with a long lance so that you can reach areas which are not easily accessible, such as the ends of rafters near the caves. Apply sufficient insecticidal wood preservative to wet all the exposed wood surfaces thoroughly but do not apply so much that it soaks through and stains the ceiling beneath. Always use a coarse spray, never a fine one. The upper surface of floorboards can be treated easily by brushing or spraying. 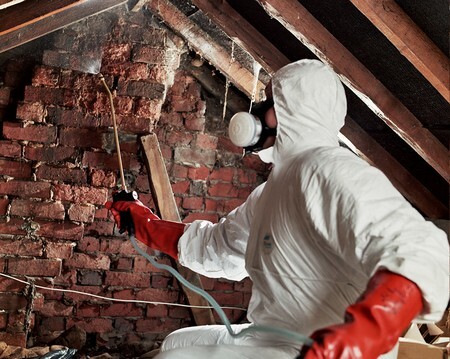 To treat the joists beneath, take up about every fourth floorboard and use a spray gun to direct the insecticidal wood preservative in all directions, wetting as much of the joists as possible.